It’s a German Zombie Pirate Captain Beatstick! I think. CONT R GB1: If you have 4 or more cards in your drop zone with the Hollow ability, this unit gets Power +2000. Then, if this unit is hollowed, it gets Power +2000. AUTO: [Put the top 2 cards of your deck into the drop zone] When this unit is placed on V or R, you may pay the cost. If you do, this unit gets Power +2000 until end of turn. 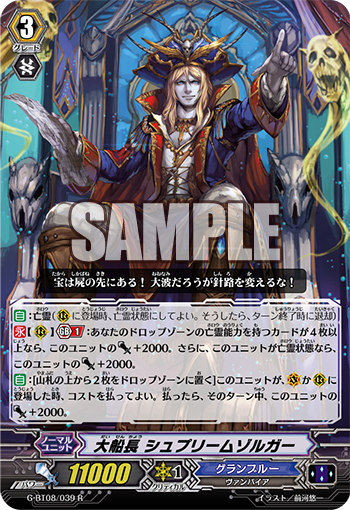 Today’s card is “Great Captain, Supreme Solger” who has the 【Hollow】 ability, appearing in “Absolute Judgment” on sale August 26th, 2016! It’s a Grade 3 Support Unit that can also use its effects as a Rearguard. If there are 4 or more Units in the Drop Zone with the 【Hollow】 ability, this card gains 2000 Power, and if this Unit itself is 【Hollow】ed, it gains an additional 2000 Power!! And since it’s a Continuous ability, it works during even your opponent’s turn, so if you did not Call it in 【Hollow】 state, it can be a hard to beat Rearguard during your opponent’s turn! It also has a When Placed skill that lets you place the top 2 cards of your Deck into the Drop Zone, which’ll give it a base Power of 17000. So this card is essentially a Grade 3 version of “Witch Doctor of the Rotten Sea, Negrorook”. Unlike “Negrorook”, it can be used on its own for the cost of the Stride, meaning you’ll be able to increase the number of valuable cards needed in the Drop Zone for 《Granblue》. But you should use them appropriately based on the distribution of Grades. By making full use of the 《Granblue》 ability, 【Hollow】, you’ll be able to place intense pressure on the opponent!